I'd have to admit I was slightly skeptical of the idea behind Interpretaciones Del Oso, an album featuring remixes of all the songs on Minus the Bear's album Menos El Oso. Don't get me wrong, I love remixes, but a whole album of remixes based on another (and already good as it is) album? 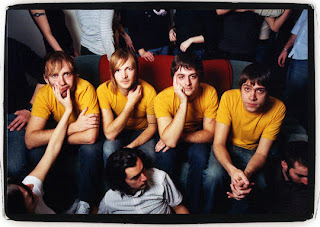 Thankfully the guest artists who remixed and reinterpreted the album are a diverse and undeniably talented bunch which includes Jason Clark of Pretty Girls Make Graves and Morgan Henderson of the Blood Brothers, lending a touch of their own flavour to each track and in doing so crafting one my most anticipated albums of 2007. Here's a couple of exclusive tracks I got from a secret source (wink, wink) to tide you over until the official album release. That's strange, sendspace seems to work fine for me. What kind of error message are you getting?